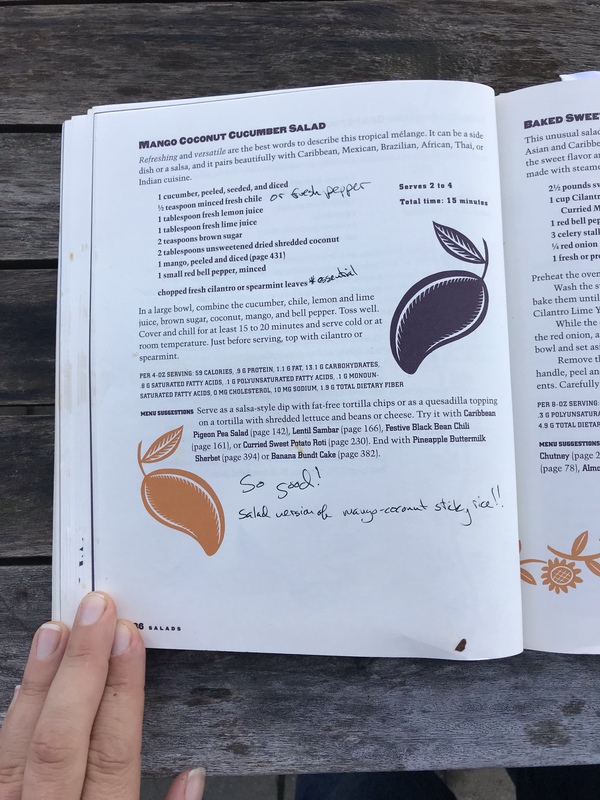 Sometimes you’re browsing through a cookbook, and you see a recipe that inspires you. Then you plan it into your week, or, if especially excited about it, you just go out and buy the ingredients and make it right then. Other times, you find yourself the recipient of buckets of garden fresh cucumbers and you’re flipping through cookbook after cookbook trying to find a recipe that uses up cucumbers. FYI. Not many people use cucumbers in recipes. You got your standard sweet-sour cucumber salad or creamy cucumber salad, and that’s about it. And neither of those options floated my boat at the time. But I did find this one! And it was so good I gave it another go and made it for my parents when they stopped by last week, and THEY liked it too. 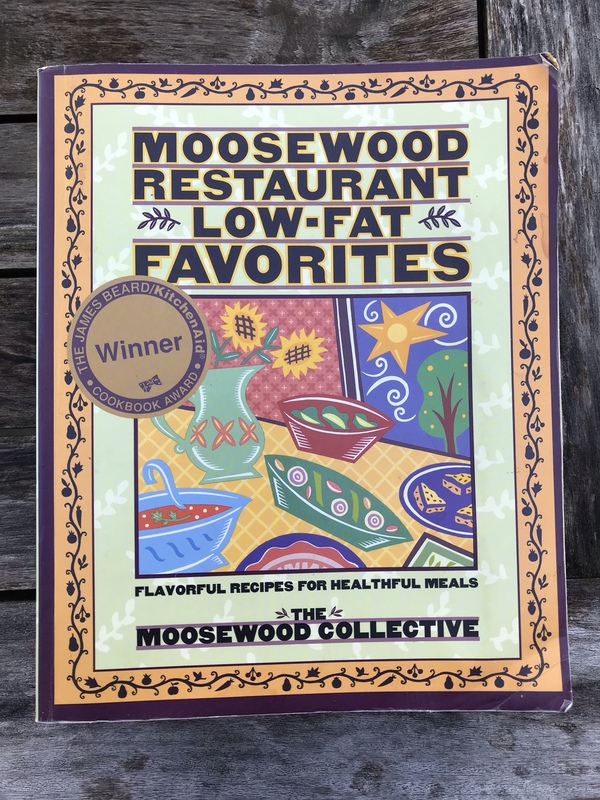 This cookbook, Moosewood Restaurant Low-Fat Favorites, is another of the Moosewood Restaurant cookbooks. I think my brother-in-law Phil gave me this one a long time ago. I’m not an anti-fat fanatic or vegetarian, but I have made several recipes in this book, appreciating the concern they give to nutrition and healthy, good-tasting recipes. It’s definitely inspiring to read through, and it gives detailed nutritional information as well as menu suggestions – ALWAYS helpful! I wish more cookbooks gave menu suggestions. At any good Thai restaurant, you can usually order coconut sticky rice topped with mango and fresh mint. A SUBLIME dessert. 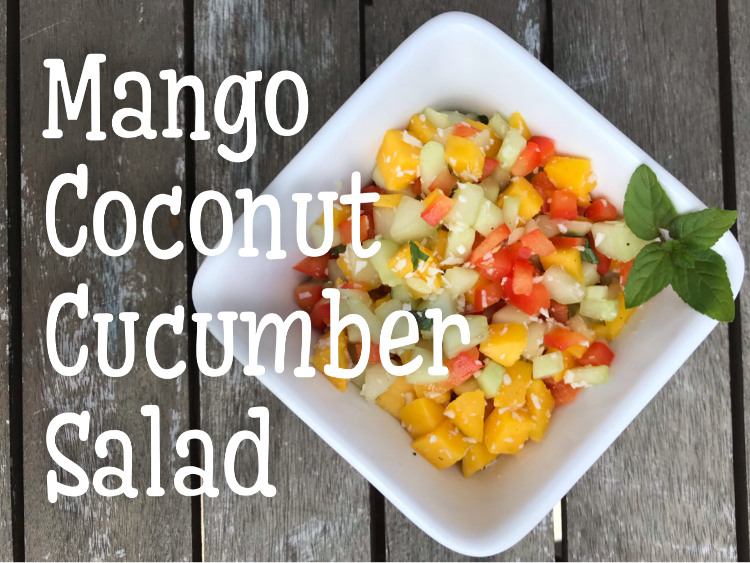 My friends, this is the salad version of that dessert! 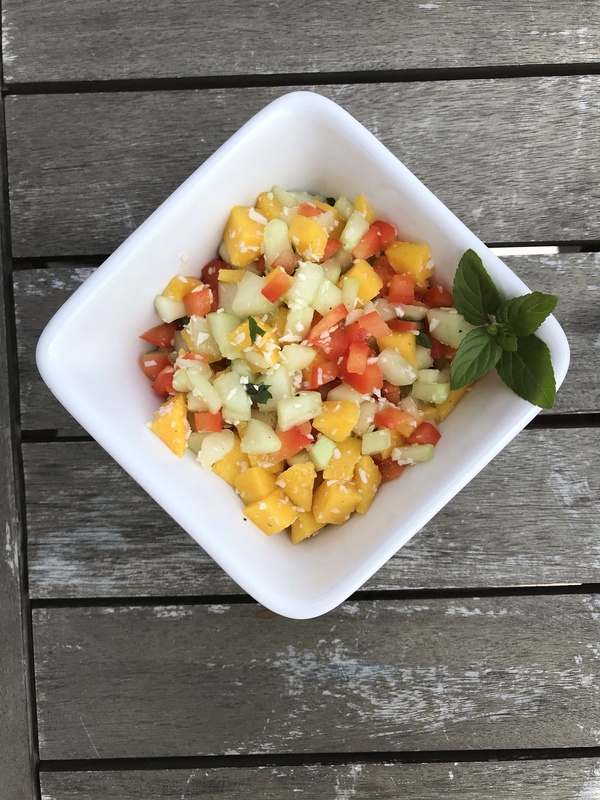 It has all those flavors – mango, coconut, snippets of fresh mint, all tossed with cucumbers and peppers in a citrus marinade. The first time I made this, I halved the recipe and scarfed it all down myself. Then when I made this for my parents, we had this as a side dish with Steve’s incredible Chicken-Bacon Mac and Cheese, a great sharpish, tangy accompaniment to just a rich main dish. The meal was rounded out by a nice loaf of bread and a salad. This recipe is absolutely perfect as is! You definitely need a perfectly ripe mango. I usually have to buy them several days before I plan to use them, to give them a chance to ripen on the counter. Combine all ingredients except mint and toss well. Cover and chill for at least 15-20 minutes. Add mint right before serving. Easy peasy! All the work in this recipe is in the prep – chopping all those veggies and fruit. As the description shows, this salad is super versatile. It goes with a wide range of cuisines, and, like in our case, it was just the right thing when you want a fresh side dish that cuts the richness of a more fat-heavy main dish.